It is a great pleasure for East Texas Communities Foundation to receive the 2017 Small Business of the Year Award from the Tyler Area Chamber of Commerce. When you think of local small businesses contributing to the economic vitality of our community, most people don’t think of a business representing the third sector…the nonprofit sector. However, ETCF and many other nonprofit organizations with small staffs are hard at work every day, addressing local charitable needs while providing good jobs for area residents, myself included. 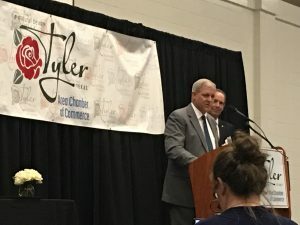 I am grateful that the philanthropic achievements of ETCF have been recognized by the Tyler Area Chamber of Commerce, but I am more grateful for the commerce in our community that has made the philanthropy possible. Without thriving and effective commerce in our region, there would be no wealth created that could be used to improve the lives of others. ETCF has been in operation for 28 years, but the generosity of East Texans predates this organization by many decades. I suppose there was modest generosity in our region all the way back to the early settlements in the 1800s, but the discovery of oil in East Texas in the 1930s turned everything up a few notches, including philanthropy. As businesses grew in Tyler and surrounding communities, so did the charitable organizations that provided healthcare, education and other non-profit services. Today, the number of charities in Smith County exceeds 1,600! Over 1,000 miles away from Smith County, the debate in Washington on tax reform may have significant ramifications on the way charitable contributions are recognized and incentivized. But at the end of the day, taxes don’t stimulate generosity. Wealth created through commerce stimulates generosity. People who are good stewards of their financial resources are typically aware of strategies to maximize the tax benefits of their charitable giving, but taxes are almost never the main reason people are generous. For most of us, generosity and commerce are inextricably linked. The ability to make generous voluntary contributions to promote the welfare of others is contingent on the fact that we have a job that provides more than adequately to support our own needs. Giving USA reported that charitable giving reached $373.25 billion in 2015, with 71% coming from individuals and the rest coming from foundations, bequests and corporations. What do all four sources of charitable giving have in common? Commerce. Show me a generous individual, and I can probably show you a job that made that individual’s wealth possible. Show me a generous foundation, and I can probably show you a successful business, that led to the creation of personal wealth, which ultimately manifested itself in the creation of a charitable foundation. Show me a bequest, and I can probably show you a person that accumulated wealth during their lifetime through hard work at a local business. Show me a generous corporation, and I can probably show you a business that is confident in their current business plan. What did it take to create $373.25 billion in charitable contributions in 2015? It took $18 trillion in gross domestic product, which is the total market value of goods and services produced by labor and property located in the U.S. that year. The East Texas Communities Foundation was founded by local business leaders and philanthropists to help individuals and organizations harness the power of their generosity for the benefit of our communities. One of the first charitable funds created at ETCF was established by the Trane Corporation to support local nonprofits. For the multitude of businesses of all sizes producing wealth in our communities today, ETCF is poised to support individual and organizational charitable interests that meet the needs of our community today and in the future. Perhaps using some of the wealth created from your hard work to establish a charitable fund is your next best opportunity to give well.